Ionarts: Emerson Quartet: Tan, Rested, Ready? 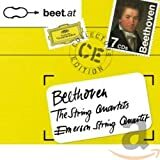 A string quartet, especially one that has been around as long as the Emerson Quartet, operates according to a delicate chemistry. Change one part of the equation, as the Emerson did when cellist David Finckel left last season, and the balance will be upset. While the group's farewell concert last spring was an unforgettable moment in my listening life, the first time hearing the quartet's new formation, on the Fortas Chamber Music Concert series at the Kennedy Center Terrace Theater on Wednesday night, was not exactly that. This is hardly a surprise, as it may take all or a large part of the season for the new cellist, Paul Watkins, to settle in comfortably. Mendelssohn's F minor quartet, op. 80, revealed some of this discomfort, with some intonation issues heard from Watkins, as well as from Philip Setzer on first violin in the the concert's first half. Not that the experience was bad, as Mendelssohn's first movement was stirred up as it should be, but the second movement, not as fast as one might like, did not really build on that tension. Likewise, the third movement did not quite feel Adagio enough, which robbed the music of much of its tenderness, but this is not unusual for the Emersons, whose performances often sound a little overly clinical. Certainly the fourth-movement finale was a tour de force of steely technique all around. Watkins seemed to blend into the texture more than his predecessor, although at times he disappeared a little too much. The most encouraging part of the evening was the middle piece, Benjamin Britten's third string quartet, op. 94. 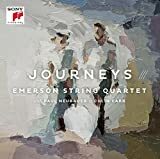 This was not because of the coincidence with the composer's anniversary year, which was nice, but because the Emersons have not yet recorded the composer's three string quartets, and on the basis of this performance, they will do that well. The tempos felt just right, with all of the parts featured beautifully in solo and duet moments, with the exception of some dicey moments high on the E string for Setzer. The Shostakovich-like qualities of the second and fourth movements, in particular, hit the group right in their wheelhouse, all growling energy and grotesque effects. Eugene Drucker was in the first violinist seat for the second half, devoted to Beethoven's ingenious C major quartet, op. 59/3, one of the "Razumovsky" quartets. Drucker's warmer, quieter sound set the tone for a performance that was turned inward, especially the gently rocking serenade of the second movement, not really a slow movement but with the pizzicato cello accompanying the singing of the upper three instruments. The third movement was bathed in honeyed tone, the warmest and most legato sound from the ensemble all evening, with a contrasting but not overly boisterous trio, and the concluding fugue was a marvel of speed and athleticism. The Emerson Quartet's regular series, sponsored by the Smithsonian Resident Associates at the National Museum of Natural History, begins on November 3 (a program that includes Britten's second quartet). Hopefully, the shutdown of the Federal government, which has shuttered the Smithsonian Museums, will be resolved by then.